Luke Bryan is heading back to the farm this fall for Farm Tour 2015, which kicks off Sept. 3 and runs through mid-October. This marks the seventh consecutive year Bryan has done the mini-tour, which continues to grow in popularity each year. Last year more than 150,000 fans attended the eight farm dates, breaking the previous year’s record. A portion of proceeds from the 2015 Farm Tour go to local college scholarships for students from a farming family in the communities where Bryan appears. 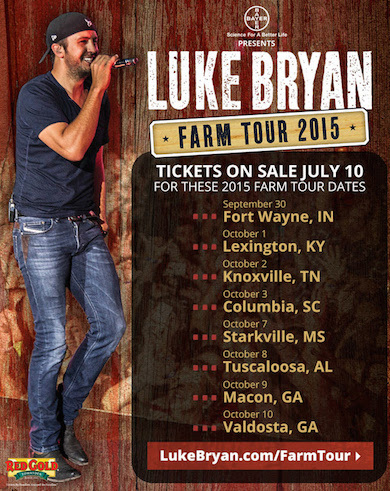 Bryan’s major Kick The Dust Up tour visits Nashville’s Vanderbilt Stadium on July 11.